Praised by the New York Times for his “dazzling, tactile grasp of the world,” Mark Doty is a renowned author of poetry and prose. He is the author of three memoirs: the New York Times-bestselling Dog Years (HarperCollins, 2007), Firebird (1999), and Heaven’s Coast (1997), as well as a book about craft and criticism, The Art of Description: World Into Word, part of the popular “Art of” series published by Graywolf Press. Throughout his writings, he shows special interest in the visual arts, as is evident in his poems and also in his book-length essay, Still Life with Oysters and Lemon (2001). He is currently at work on a memoir that centers on his poetic relationship with Walt Whitman, entitled What Is the Grass. He is the author of nine books of poetry, most recently Deep Lane (W.W. Norton, 2015), a book of descents: into the earth beneath the garden, into the dark substrata of a life. But these poems seek repair, finally, through the possibilities that sustain the speaker above ground: art and ardor, animals and gardens, the pleasure of seeing, the world tuned by the word. Fire to Fire: New and Selected Poems was published in 2008 and won the National Book Award for that year—in their citation, the National Book Award judges wrote, “Elegant, plain-spoken, and unflinching, Mark Doty’s poems in Fire to Fire gently invite us to share their ferocious compassion. With their praise for the world and their fierce accusation, their defiance and applause, they combine grief and glory in a music of crazy excelsis.” Doty is the first American poet to have won Great Britain’s T. S. Eliot Prize, for My Alexandria (1993), which also received both the Los Angeles Times Book Prize and the National Book Critics Circle Award. His other collections of poetry include: Turtle, Swan (1987); Atlantis (1995); Sweet Machine (1998); Source (2001); and the critically acclaimed volume, School of the Arts (HarperCollins, 2005). In addition to the National Book Award, Doty has also received two NEA fellowships, a Guggenheim Fellowship, a Whiting Writers Award, a Lila Wallace/Readers Digest Award, and the Witter Byner Prize. As the award citation for the last of these noted, “Mark Doty’s poems extend the range of the American lyric.” In 2011 Doty was elected a Chancellor of the Academy of American Poets. Doty is a Distinguished Professor at Rutgers University, and also teaches in NYU’s low-residency MFA program in Paris. led to the palace of wisdom, wouldn’t that be nice? 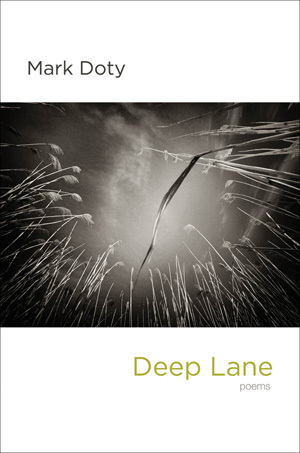 Deep Lane is a book of descents: into the earth beneath the garden, into the dark substrata of a life. But these poems seek repair, finally, through the possibilities that sustain the speaker aboveground: gardens and animals, the pleasure of seeing, the world tuned by the word. Time and again, an image of immolation and sacrifice is undercut by the fierce fortitude of nature: nature that is not just a solace but a potent antidote and cure. Ranging from agony to rapture, from great depths to hard-won heights, these are poems of grace and nobility. “It sounds like a simple thing, to say what you see,” Mark Doty begins. “But try to find words for the shades of a mottled sassafras leaf, or the reflectivity of a bay on an August morning, or the very beginnings of desire stirring in the gaze of someone looking right into your eyes . . .” Doty finds refuge in the sensory experience found in poems by Blake, Whitman, Bishop, and others. The Art of Description is an invaluable book by one of America’s most revered writers and teachers. National Book Award winner, Fire to Fire, collects the best of Mark Doty’s seven books of poetry, along with a generous selection of new work. Our mortal situation, the evanescent beauty of the world, desire’s transformative power, the dignity of the powerless, the instructive presence of animals, and art’s ability to give shape to human lives: Doty’s subjects echo and develop across twenty years of poems that speak to the crises and possibilities of our times. With School of the Arts, Mark Doty’s darkly graceful seventh collection, the poet reinvents his own voice at midlife, finding his way through a troubled passage. At once witty and disconsolate—formally inventive, acutely attentive, insistently alive—this is a book of fierce vulnerability that explores the ways in which we are educated by the implacable powers of time and desire in a world that constantly renews itself. How could I answer the child? I think of her question for years. the matter need not be looked into again. — for him the word settled nothing at all. fragrant with soil, has rested on the fence-board beside my hand. Perception is simultaneous and layered, and to single out any aspect of it for naming is to turn your attention away from myriad other things, those braiding elements of the sensorium—that continuous, complex response to things perpetually delivered by the senses, the encompassing sphere that is such a large part of our subjectivity. No dog has ever said a word, but that doesn’t mean they live outside the world of speech. They listen acutely. They wait to hear a term—biscuit, walk—and an inflection they know. What a stream of incomprehensible signs passes over them as they wait, patiently, for one of a few familiar words! Because they do not speak, except in the most limited fashion, we are always trying to figure them out. The expression is telling: to “figure out” is to make figures of speech, to invent metaphors to help us understand the world. To choose to live with a dog is to agree to participate in a long process of interpretation—a mutual agreement, though the human being holds most of the cards.